A variety of special weapons from the original Splatoon. The special weapon is a powerful type of weapon in Splatoon and Splatoon 2. There are several different kinds of special weapons, but they can all turn the tide of a battle when in the right hands. Along with the main weapon and sub weapon, every set of weapons comes with a special weapon. These weapons are designed to be very powerful and table-turning, and may only be utilized for a short time once players have filled their special gauge. When a player has a special weapon ready, it creates a unique effect: they will give off sparks, the tentacles on their head will become very brightly colored and glowing, bubbles will form at the top of their head as if from boiling water, and they will appear to be caught in a strong wind even when completely still. Activating a special weapon makes the player's Inkling do a frontflip and completely refills the Ink Tank. Special weapons are available by filling the special gauge by inking the ground in matchmaking modes, obtaining a canned special in the Battle Dojo and singleplayer modes such as Octo Valley, starting a Salmon Run session where players have access to two specials, or starting specific missions in Octo Expansion where the special is obtained via the Equipper. Once a special weapon is ready, clicking will activate it. 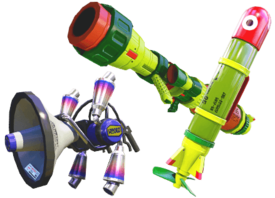 Different special weapons need different amounts of turf inked to fully charge, for balancing purposes; for instance, the Inkzooka requires 220 points to charge as of version 2.0.0, whereas the Killer Wail requires only 160. The rate at which the special gauge depletes after being activated depends on which particular Special Weapon is in use. If the player is splatted before the gauge is completely depleted, they will respawn with a portion of the remaining gauge filled (how much depends upon the special depletion class of the main weapon; see special depletion below). This can be increased by equipping gear with Special Saver. Abilities on a player's gear can affect special weapons. The following abilities have effects that directly affect the performance of special weapons. The in-universe reason that no Splatoon special weapons return in Splatoon 2 is attributed to new regulations as revealed on a Sunken Scroll, where protest signs are also shown. During both fights with Agent 3 in Octo Expansion, Agent 3 is able to use different special weapons despite only using one main weapon, and is even able to use them consecutively. This is explained by Marina in the Spinal Phase fight, saying that Agent 3 had removed their limiter, which implies that Inklings (and Octolings) can normally use many specials and have to put on something that restricts this ability. An Inkling with a Special Weapon ready.